Dog Christmas Stockings. Celebrate the Holidays with these beautiful Dog Breed Christmas Stockings featuring charming Dog breed artwork images. 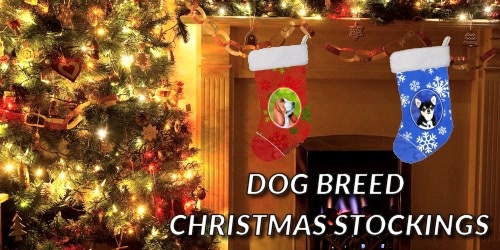 Beautiful Dog breed Christmas Stockings for your favorite dog. A Christmas stocking hung by the chimney with care, in hopes that St. Nicholas would place dog cookies there !